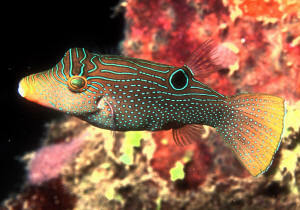 Canthigaster solandri. N. Sulawesi pix. I purchased a blue spotted puffer last friday and the first day he was out and about and the second day was out and nibbling on the rocks. For the past two days he has spent the day hiding vertically behind a rock. Yesterday, I did see him out in front and seemed fine and a few minutes later went back to his hiding spot. I have had saltwater tanks for 15 years but never this variety of fish. There are two blue damsels and a larger yellow damsel who is the dominant fish, but I have not seen much harassment. All of the tank parameters are excellent ( ammonia, nitrate, nitrite 0) and the tank has a great amount of live rock. Any ideas? Thank you for the timely reply Bob, really appreciate that. Yeah, I'm not going to panic--I have dealt with so many tragedies/learning instances over the years. Not only 15 years of SW tanks but years of FW as well, yet am still not an expert as yourself...and funny as I advise people on their setups. BTW, I have your book which is so legendary and give a thank you for all the dedication to you and your crew.....now, hoping my new little guy comes out as he is really pretty and my 8-year old son is bummed that he is not out. I have to show him the puffer is there, with a flashlight. Hi Bob, Just an update and still wondering--the Toby is still here but he only comes out when the lights are off. I have noticed him grazing on the rocks when it is dark--otherwise he just sits on a cave-like rock in the back of the tank. Kind of bums me out because he is a nice looking fish yet we never see him. Well, it's on the small side--30 gal. that by under stocking and providing ample hiding spots. Just don't have the space for larger systems and plan on stocking small as I've started delving into coral as well. That yellow guy has always been rambunctious as he would nip at my hand when cleaning all the time. That guy chases those blue damsels all the time--been this way for 5 years. Hi Bob, Me again--so, yesterday I removed the yellow damsel and put him in a small temporary tank I have to see if the Toby gains comfort and comes out. While I have seen him grazing on the rocks in the dark, I am worried that he does not get any meaty food. He was out with the blue lights on this morning but as soon as the white came on he retreated to his hiding spot. Tried putting Prime reef food and he did not budge. Wondering if it might take a few days for him to gain comfort. I have tried daily to get him to eat frozen food to no avail but the good news is, is that he did eat a little bit of fresh shrimp this morning. The blue damsels don't seem to care about him, so I hardly think there is any intimidation there. I guess you could say there is progress but it is hard to be certain that it is because the damsel is not there--guess if a day or so after the damsel was gone and the Toby was out swimming all the time it would be certain. So, my dilemma becomes the situation with the yellow damsel as in do I wait and hope the Toby becomes outgoing and possibly put the damsel back in or do I take him to the fish store? The yellow damsel is not too happy in his small tank as he just sits in the corner, but he eats. he adds color and activity but would this be at the expense of the Toby only hiding all day? Apologies, it's been such a long time since I made contact. I just couldn't remember where to post my question regarding: puffer sleeping habit. 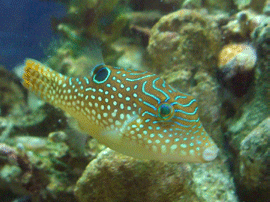 Here it goes: I have just acquired a cute under two inch long Canthigaster Solandri puffer. I have observed it closely. A couple of minutes after dimming the lights, the puffer regularly heads for its favorite sleeping space and anchors itself vertically onto the live rock. I would like to know how the puffer performs this feat and is it for camouflage purpose? <Protection, hiding, general shelter from the current, all you'd expect. Thank you so much for all the vital information that's continually generously been poured into the site. Ah brilliant! Thanks from Toby & I.
Hi again Earl, I don't have a timer nor dimmer yet. Since I found the fish to be quite timid and sensitive, for now am using basics, just three sheets of blue tinted acetate and regularly starting at around 5:30 pm start to slowly layering them up under the led bulb until it creates a moonlight effect. Very relaxing process. Will try saving up for a dimmer! <Heya. It doesn't matter as long as it's consistent i.e. the lights are on and off at the same time every day, plus it's simply worlds of convenience for the caretaker. Your plan seems ok although you do need to get it up to full light around midday etc.. You mentioned that the fist is new to your tank so he will likely get less timid regarding the light although as per WWM/CMA leaving the lights off for a day or two is always a good idea. It's the opinion of myself and also those worlds beyond my own expertise that aquarium reef fish are not well off in total darkness so a moonlight style lamp all night (VERY dim) rather than complete blackness is preferable. I would suggest a simple controller if you plan to get into that level of specificity as far as ramping up intensity, etc.. There are comparatively cheap ones on the market now compared to a few years ago (I use a Reefkeeper Lite on my fish-only tank). You can get them on the secondary market as they are solid but simple entry-level controllers and aquarists tend to want the "latest and greatest" and sell older gear as they upgrade to (IMO often needlessly complex) gadgetry with computer-linked wireless control, apps, and so on. This model has 4 outlets, I used one for the heater, 1 for a halide that came on first and turned off last, and another outlet that turned on 2 more lamps a few hours later for a "noon day" period and those turned off after a few hours. I went a decade without a controller and now I wonder how I lived without it! I have gone way off track here but the extra security is invaluable imo besides the obvious other uses. The $15 hardware store version in the meantime is: just use regular old plug-in timers and use one per lamp. Say you have 2 separate fixtures. Just time one to come on earlier, go off later, as per above, you get the idea. Final quick note: Near its bedtime, the puffer becomes quite defensive and does the rounds to check if predators(including me) are in the area. And, regardless whether or not the light is fully dimmed, by 8:30pm is anchored to its rock, ready to doze off. but he spends 80% of his time hovering in the same spot. Is this normal since he is new? Thanks! Thank you for the response! I have one more quick question regarding the leopard Toby puffer. When eating food added to the tank, the puffer bites the food then spits it back out. He does this over and over. Is this normal? I've checked and checked and I'm 99% sure she is a puffer, so my question is, is it normal for a Saddled Toby to be very happy and never puff up as the only difference I can tell between the two is the dorsal fin, or lack of in a puffer? I'm sorry for asking a dumb question. thank you so much for your quick reply, firstly yep 'Brill' is a great thing to be called, I'm a Brit so we like to shorten everything. Secondly it's nice to hear from someone else that loves stomatopods, they are so fascinating to watch, every time we sit at our dining room table out he pops to show off, I've taken many videos of him as he is such fun. Thirdly, I'm right (due to your help) I do indeed have a happy puffer fish not a filefish, I'm so happy, not that I would have sent her back to my LFS as I've grown very attached to her, so cute. Well off I go to feed my crew (4 tanks of marines, 1 cold water tank, and 2 ponds with sturgeon) (I won't bore you with my other pets, the list is endless) I hope you enjoyed your waffles, urmmm my fav. I had just recently bought a tiny Valentini Puffer, and I've been examining him for about a week now. I've done countless research on his behavior so I could understand this little creature, but one question still remains in my head that I cannot find the answer to: his tail. He often keeps it closed, swimming around, swaying it left and right every now and then... But every now and then, he opens it. I'm not complaining though, because it is absolutely beautiful. But what could this mean? What does it mean for it to be closed, swaying around, and open? I'm just wanting to understand. Thanks for all your help and knowledge. I'm a graduate student doing some work on lionfish down in the Caribbean and witnessed an unusual interaction between invasive lionfish and a Caribbean Sharpnose Puffer (Canthigaster rostrata) that I'd be curious to hear your take on! During the capture, handling, and tagging of lionfish that makes up the bulk of my project, the skin covering the venomous dorsal spines of lionfish are often tugged down as they poke through the collection nets. On one occasion, after one such fish was released from its bag and was sitting on the reef recovering, a Sharpnose puffer came over and began biting at the exposed portion of the dorsal spines. On fish re-sighted after tagging, these exposed spines are often shorter and blunted, as though the exposed end has been bitten off. I was just wondering if your team has had any experiences with Sharpnose puffers biting off fish spines in the past, and on what might cause this behavior? I know they're known for biting in close quarters, but this didn't look like a territorial encounter as the puffer looked more like he was grazing or investigating a snack than trying to drive the lionfish off. I wondered if there's any nutritional benefit to puffers from nipping fins or spines that might explain this? I've benefited from the wisdom of WWM many times before, and recognize that for many of the less-studied marine ornamentals, hobbyists probably know more about behavior than academics, so I look forward to hearing what you think. Thanks a million! Firstly, Thanks so much for the service you guys provide, I have learned a lot from reading the WWM site and hope to keep doing so. established (stable at these parameters) for around 3mths now. and he hits his head and face on the LR. I'm sure he must be damaging his eyes when he does it too. He does it every so often and I have no idea if this is normal behaviour or not? I know this fish is intelligent because he knows when its food time and also knows who to beg to get any extra tidbits and his charming ways have even melted my dad's heart, something I thought would never happen! Anyway, another quirk my little Toby has is he will swim around normally but if I watch him for more than a couple of minutes, he will swim up to the LR and then scrape his belly or sides along it and he keeps doing it while I'm sitting in front of the tank. If I get up and walk away, he goes back to normal, just chillin' with the clownfish. He does not do this if anyone else watches the tank, just me. Is this normal as well? rubbing-against-the-LR-only-when-I'm-nearby since I got him. Also, just a little side note, Toby likes to sleep in a vertical position with his belly in the corner of the tank, using his fins to hold himself there. I think it may just be his way of finding somewhere safe to sleep so am not particularly worried about this, but thought I would share. Also, the orange ocellaris, who has taken Toby as her role model (apparently no one has told her things wont work out well between them! ), has also adopted this sleeping pattern after trying to perfect it for the last month! Anyway, thanks in advance, any help is much appreciated! Thanks so much for the quick reply, I can relax knowing that he is 'normal'. I have a Blue Dot Puffer (*Canthigaster solandri) *in a 75 gallon tank with approximately 50 pound of live rock, crushed coral substrate 2"-3" inches deep and he is living with two small damsels. The tank has been up and cycled for about 6 months and the puffer has lived in for about 4 months. All water parameters fall with the normal range. Recently, he has begun to exhibit a strange behavior. Starting from the lower front corner of the tank, he partially inflates, expands all fins, positions himself at a 45 degree angle (nose up), then zips across the bottom front of the tank. He also gets a sort of crest at the top and bottom of his body. He will do this back and forth for ten or fifteen minutes then just swims off an acts normal. He shows no signs of any disease or problem and he eats well. I was wondering if something is wrong with him or if this is just goofy puffer behavior. Thanks in advance for any help you can give me! The damsels don't seem to be involved at any point in this behavior, before, during or after...Is there anything that I can do to alleviate this "jail fever"? Like most readers of your forums/library, I utilize your site as my premier encyclopedia for all things marine. I recently purchased a Leopard Toby Puffer (Canthigaster leoparda), as I have a 34 gallon reef tank (a Solana, AIO, if you're familiar) and this is the smallest puffer I could get my hands on (I know these fish may eat inverts, but it's a risk I'm willing to take. There isn't much literature about this species, so I thought it had a better shot than most tobys to fare well in my reef, with its diminutive size and smaller mouth hopefully deterring it from eating too many critters). It is merely an inch long now, and I expect it double in size one day. Upon acclimation 2 days ago, the little guy seemed to be in shock, lying on its side for a couple hours). It regained balance (maybe ammonia poisoning or something, there was a ridiculous amount of poop in the bag for such a small guy - clearly a testament to the large bioload of these puffers) and then moved to the corner of the tank that is out of direct light and low in current. I understand that these puffers are found deeper in the ocean, and my thoughts are that mine may be adjusting to the lighting (250 watt MH) as it is hiding either in the corner or behind the liverock. This fish is the last addition to the tank and most aggressive, with a pair of very feisty Jans' pipefish (voracious eaters of frozen mysis and other meaty offerings), a pair of black ocellaris clowns, and a high finned goby. Is it common for these tobys to be very shy upon arrival, or should I be alarmed? and enriched brine. I was just expecting a much more aggressive or active fish and though it's too soon to tell his personality, want to make sure this is a normal part of the acclimation process. By the way, I will eventually be taking a photo and submitting to you, as you do not have one in your Toby puffer faq.